This is seriously the easiest ice cream cake you will ever make. I had never seen it done until this summer, 1st at a staff potluck and 2nd at a Canada Day BBQ. You can make it big or small. That's it - it's that easy and so tasty! My husband woulg go CRAZY for this! Thanks for sharing another yummy recipe! Love your blog! Icecream cakes can be pretty pricey, this is WONDERFUL!! I saw something similar in Kraft magazine and I thought it was so clever. It's looks delicious! Oh my! This sounds very very good! I just saw Rachel Ray do a similar one--but your cake looks even better. Very fun! My oh my that looks out of this world! My kids would LOVE this! I make something very similar. The recipe's from Kraft. 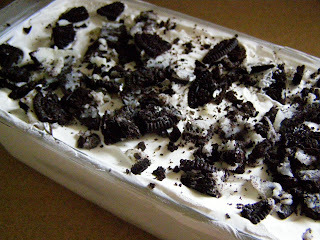 Wth mine I add a layer of fudge sauce that has crushed oreos between the sandwiches. Wow!! This looks gorgeous!! I love ice cream, sorbet, gelato.... Yummm!! Wow! 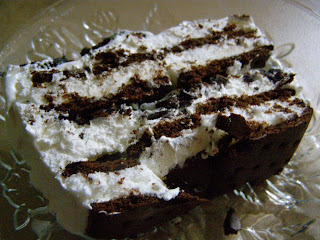 I can't believe it can be so easy to make an ice cream cake! Thanks for sharing this!